If you are approaching the festive season with a shortage of gifts for a tall man in your life, look no further than our gift card guide. Not only is it the safest way to arrange a last minute gift, it gives tall men the choice of how to spend it. Here are some ideas for gift cards depending on the person you're buying for. And you can always spend it during the sale to make the gift go even further! For the man who likes to keep up with the latest denim trends, finding tall sizes is always a challenge but here are two suggestions to help. For styles in a 38 inch inseam and plenty of choice in a 36 inch inseam, we recommend Buckle. 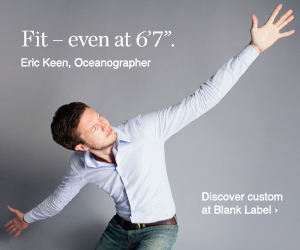 Their own BKE brand is always a winner for tall sizes, and they have one of the best selections of other tall styles as well. What's more everything is easily selectable by inseam. A Buckle gift card will certainly appeal to a tall man in search of latest fashion denim. At the smarter end of the spectrum, why not give a tall man the chance to building their business wardrobe? Charles Tyrwhitt offers a great selection of shirts adhering to traditional British quality and style, made from the highest quality pure cotton. The slim and tailored styles in particular are cut for a clean, professional look that will flatter a tall slim man. Available in collar size up to 20 inches and sleeve length up to 37 or 38 inches. If you're after a special gift, look out for the Black Label shirts or the Sea Island cotton. Paul Fredrick, on the other hand, is your source for classic American style for a gentleman's wardrobe. Knitwear, sports jackets, casual shirts, you can find them all in a variety of tall sizes at Paul Fredrick. If you're really not sure what will appeal, here a couple of options that will give a tall man plenty of choices. For anyone in search of casual clothing and footwear, Zappos gives a range of options and a reputation for excellent service. In addition to a huge range of shoes in large sizes, including trainers and casual wear, Zappos also has a range of longer inseam jeans and trousers and some large and tall size casual shirts. Jos. A Bank also have a wide range of Big & Tall items and are a great source for affordable smart and casual wear for men while Eddie Bauer covers both casual and outdoor wear.